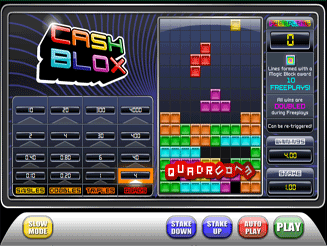 Slotblox (or "Cashblox" as it’s sometimes referred to) is a completely luck-based version of Tetris. You simply click a button, watch those famous Tetris-shaped blocks drop and hope that you make some lines. It’s great that there is a Tetris-based game for real money on the Internet, but it’s just disappointing that it isn’t more interactive in any way. The potential to win big is nice (£20,000), but the fact that you can only click and hope in each game leaves you feeling a little empty and disappointed at what could have been for this game. Yes, it’s actually addictive, but it’s disappointingly addictive (if such an feeling exists). Still, there’s something ever-so-satisfying about watching a long 4-block drop to clear a quad, regardless of whether you made it happen or not. 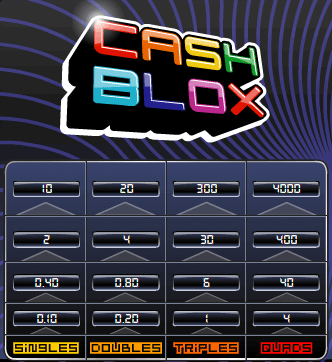 On a positive note, Slotblox is about as addictive as you can get for a game with absolutely no interactivity. It’s just as fun as it is frustrating when you only just miss out on a line, but that’s what tempts you in to having another go. Lord knows I played far too much Tetris when I was younger, so the fact that I could make a killing if I could guide the blocks myself destroys my soul. However, the fact that it brings back warm memories makes it a moderately enjoyable game to play. Fact: The original Tetris music isn’t used in the Slotblox online game. That’s either a little disappointing or a really, really good thing. If you’ve never really played Tetris before, Slotblox is going to lose it’s appeal completely. The only redeeming feature otherwise would be the maximum win of 4000x your stake. The basics of the Slotblox game. Click a button to start the game. Watch the Tetris-shaped blocks drop down. Hope that you can make some lines and win some money. Reminisce about the good old days playing Tetris on the original GameBoy. Not really all that much to playing Slotblox online. The payout structure is the only part that could take some explaining, and even that isn’t exactly difficult. If you manage to form a line with a "magic block" (a shiny/sparkly block that comes around every now and then) you win a bunch of free games. Ten to be precise. During the free games your winnings are doubled, so it’s worth getting excited about that magic block when you hear it drop down. The more lines you can clear at a time, the bigger the win. The more times you can clear a set number of lines, the more the payout increases again. Here’s a screenshot of the payout table for a £1 stake in Slotblox (it’s called "Cash Blox" or "Cashblox" at Paddy Power Games). If you get one single in a game, you win £0.10. However, if you get two singles in a game (one row then another shortly after) you win £0.40 on top, which results in a total win of £0.50. To get the maximum win of 4,000 times your stake, you need to get four quads (4 rows at a time) in one game. It’s unlikely, but it’s this potential to win big that will keep you playing.